Experience the gold coast of San Juan Island. 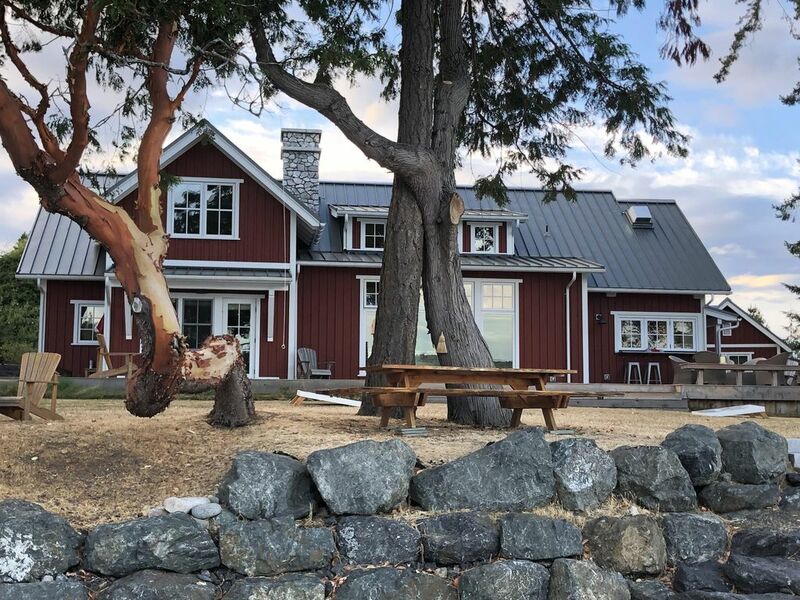 Located walking distance to Roche Harbor, White Point is a true island getaway. Situated on low bank waterfront, our home faces Garrison Bay and British Camp National Park and has expansive views of Gus Island, Mt. Young and Yacht Haven. Our newly constructed Scandinavian farmhouse features wide plank oak floors, Sub Zero Fridge, Wolf Gas Stove, Sub Zero Beverage Cooler and Carrera marble countertops. Dining Rooms Table seats 12. This cottage chic style house was built in 2015 and is charming, sophisticated and comfortable. The main house has two master suites each with king beds. And the accompanying guest house has one master bedroom with a queen bed, a bunk room with four built-in twin beds and a large bathroom. What's there not to love? With a salt water hot tub, large wooden deck outdoor fire pit, and two hammocks overlooking the water you're bound to fall in love with the magic of this property. Large Live Edge Fir Picnic table at the water's edge seats 12 for Al Fresca dining. Both the houses have flat screen TVs, DVD/VCD players, audio systems and wireless internet. The main house surround sound 75" Flat Screen and has Sonos sound system built-in the rooms. Besides just relaxing, San Juan Island offers whale watching, kayaking, sailing, hiking, and much more. This property is a twenty-minute drive from Friday Harbor and a mile down the road from Roche Harbor. Summers on San Juan Island have been a part of our lives for 25 years. We summer at our amazing property with the exception of a few rare weeks when we rent it out for others to enjoy. We finished construction of our waterfront house in July 2015. It is very luxurious and beautifully appointed. The moon and stars at night are amazing. Westcott Bay is a protected salt water Bay and the views of Mt Young National Park (British Camp) and Yacht Haven (Garrison Bay) are stunning both day and night. Beautifully appointed homes. Stone Countertops throughout. Wet Bar in the dining room for easy entertaining to the Living room as well as the Al Fresca on the front patio. Master Bath Shower is also a steam bath. Master Bedroom door leads to our deck with a Salt Water Hot Tub. All rooms in the waterfront home have speakers and SONOS music system controllable by a smart phone to play Pandora, Play lists or Spotify in each room. Luxurious Bathrooms with heated stone floors throughout, Cararra Marble countertops and shower in the Guest Suite, Crema Marfil Marble in the Master Suite floors, steam shower and countertops. Jerusalem Gold marble in the Guest House Bathroom floors, shower and countertops. Two Lane private dead-end road with 12 homes on it. Lots of wild roses and open space at White Point. Easy walk to Roche Harbor Village with very little cars traffic. Roche Harbor Village is a 5 minute by car or 20 minute by foot. This village was built in 1889 as the Roche Harbor Lime & Cement Company. With a historic hotel, formal gardens and a large marina. Southeast exposure for great sun and amazing moons at night! Sweeping views of Westcott Bay, Garrison Bay and Crescent Bay, Mount Young and British Camp National Park. The Main waterfront home has wide plank white oak hardwood floors throughout. Living room and dining room have vaulted ceilings with heavy timber and car decking. A large sectional couch in the living room for reading, lounging or watching a movie. There is a card table that seats four for games and jigsaw puzzles. The living room and dining room walls are custom paneled floor to ceiling and painted white. There are two NanaWalls for al Fresca dining at the dining room and at the pass thru stainless steel counter top outside of the kitchen on the water side that seats four. Master Bedroom has heavy timber beams and car decking ceiling. A door off of the Master leads to the waterfront ironwood deck and a saltwater spa. This is an elegant "cozy chic" cottage and guest house right on the water located towards the end of White Point (a very private peninsula) with only 12 homes located on a private dead-end road. This is a very special home for those with discriminating taste! My family and I very much enjoyed spending 10 days in August in this Roche Harbor waterfront. It is clear that the owners take great pride in this home, and want their guests to have the best of experiences. The house itself is lovely....well designed, tastefully decorated, and well appointed. The layout was perfect for our small family and guests in that we enjoyed the 2 bedroom main house, while our guests occupied the 2 bedroom guest house. This design afforded privacy, while at the same time allowed for the entire group comfortably assembling in the living room/dining room/kitchen area or the large deck area. We enjoyed cooking in the well stocked kitchen, as well as, using the grill, and congregating around the fire pit or using the hot tube in the evenings. The bedrooms have fine bedding. There is nothing better than sleeping with the windows open and a cool sea breeze flowing through while under thick down comforters. The location was perfect for our needs...close enough to everything to be convenient, but far enough away to feel removed. Roche Harbor is only a few minute drive should you need to pick up something at the grocery or lunch at the Madrona Harbor Grill. Two of our favorite places are around 5 or less minutes away.....the Duck Soup Inn and the Westcott Bay Shellfish Company. Neither should be missed on a visit to San Juan Island. And Friday Harbor is about a 20 minute drive through beautiful scenary regardless of the route you take. I should also mention that all of our interactions with Brad Augustine were very positive and professional. He made the entire rental process very easy and straightforward. A beautiful home right on the water with great views of boats going by along with some wildlofe. The house is comfortable and spacious enough for an extended family of eight to enjoy pleasantly. The whole house is nicely built with top of the line materials and appliances. Preparing meals in the kitchen was a joy with almost all the tools we desired being provided. We all loved the big yard with plenty of space for play. We were able to explore the area on our walks to Roche Harbor and by water on our kayaks. The owners were great about contacting us ahead of time with directions, instructions and information about the house. We were so thankful to them for accomodating us when our planned lodging sold the house we had rented shortly before our trip. This location was so much better as it turned out, so we again were pleased to be able to stay here. They have reaffirmed our faith in vacation homes by owners! It is a very nice house. This house is amazing you will not be disappointed. We have been coming to San Juan Island for years and this house is amazing. The owners are very accommodating and make you feel at home. Steps from the water with spectacular views, hot tub, beautiful deck, unbelievable. I was a bit surprised to read the review regarding the Owner's sensitivity to damage. With my family and me, the Owners (a husband and wife) were nothing but understanding, welcoming and extremely nice. We absolutely loved our time at the Waterfront Cottage Chic property and hope to come back this summer. The main house just recently finished new construction, and it is nothing but amazing. All details were thought of - whether it be the steam shower in the master bedroom, the elegant yet livable decorating, the coziest sectional ever, or the top of the line kitchen appliances and tools. We felt right at home and had a hard time saying goodbye! We stayed with our two young children in this amazing property and can't wait to come back! The views from the property are outstanding, and the home is a combination of a cozy cottage and a five star hotel. The kitchen is open and full of everything you would possibly ever need, and the home feels very welcoming. The views are beyond compare, and the special touches make you feel right at home. We enjoyed short walks to the nearby resort, exploring the waterfront, and cozy nights by the fire. I can't imagine every staying anywhere else on San Juan again! This home is the perfect blend of sophistication and cozy. It has everything you need to be comfortable and entertained during your stay. Westcott Bay views present themselves from almost every room. While we were there, we walked to Roche Harbor, kayaked in the bay, sat in the hot tub, enjoyed the outdoor fireplace, made use of the gourmet kitchen, combed the beach, laid in the hammocks, and played a rousing game of giant Jenga on the deck. We felt secluded, as the landscape is fully grown and the neighbors are quite a distance away. The adults stayed in the main house, while the teenagers claimed the carriage house - a perfect set up for our group. I am looking forward to visiting this wonderful house again. Beaches, Beachcombing, Bird Watching, Marina, Public Swimming Pool, Golfing, Groceries, Hiking, Whale watching, British and American Camp National Parks.